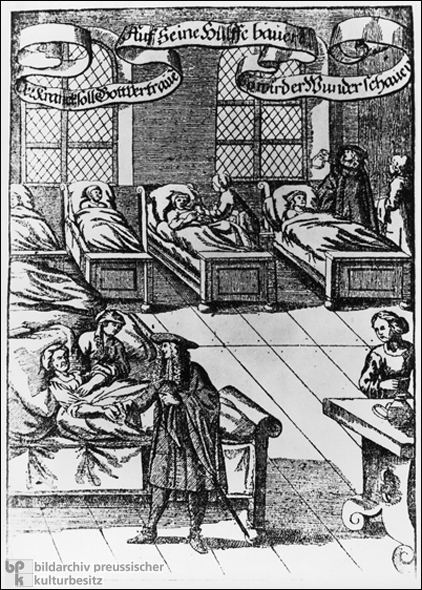 This engraving shows a doctor during his rounds in the sick ward. The banner at the top of the image reads, “The patient ought to trust in God … Count on His help … and thus he shall behold miracles.” Previously religious orders had assumed responsibility for in-patient treatment of this kind. Over the course of the next century, municipal and state authorities began to assume more responsibility for founding and administering hospitals. Berlin’s Charité, for example, opened in 1727. Copperplate engraving by an unknown artist, c. 1680.